Make sure you have the Ink Cartridge set to Color + Black, Color Matching set to PrimaColor, Print Black using only Black Cartridge set to Yes. Note: "Print Black using only Black Cartridge" is not available using the Macintosh Bravo II driver. Important Note for All Printers: Original Image format can have a large effect on whether black will print with only the black cartridge. In order for the printer driver to use only the black cartridge to print black it must recognize that color as true black (#000000, R=0 G=0 B=0) There can be no gradation in the image. Gradation may not even be visible on screen. Gradation, pixilation or artifacts can occur if the image has been compressed. JPG, GIF, PNG, and PDF are typically compressed images. For example, imagine that you have created an image in Adobe Illustrator that has black text and areas of black. If you print this image from Adobe using the original AI file format the black areas would print with just the black cartridge if you were using the settings noted above. However, if you export this image to JPG, then import it into SureThing or NiceLabel (LX800), and then print, the black areas will most likely not print with the black cartridge only. The black areas are no longer true black because they have (1) been compressed by Illustrator into JPG and (2) been imported and reinterpreted by SureThing or NiceLabel (LX800). There are several ways to fix this problem. 1. Export images from other programs in noncompressed formats like BMP or TIF. However, even this sometimes does not solve the problem if you import these images into SureThing or NiceLabel (LX800). The true black color can be lost in the importation process. 2. Do not export images to other formats. Instead create an PRN file of the original file format directly printed from the original source program to the printer. Click here for instruction on creating PRN files. 3. If the black areas you are attempting to print with the black cartridge are made up of text try importing only the background image into SureThing and then create the black text in SureThing. Finally, understand that printing black with black cartridge only will almost never look better than the same image printed with just the color cartridge. The reason to make it print with just the black cartridge should be for ink consumption reasons not quality reasons. The only exception may be when you are printing black text or barcodes to the LX800. How do I reset my ink cartridge levels? How do I print my labels all the way to the center or outer edge of the disc? There are no devices compatible with this template. Do you want to print on plain paper? Error appears when printing a SureThing file. 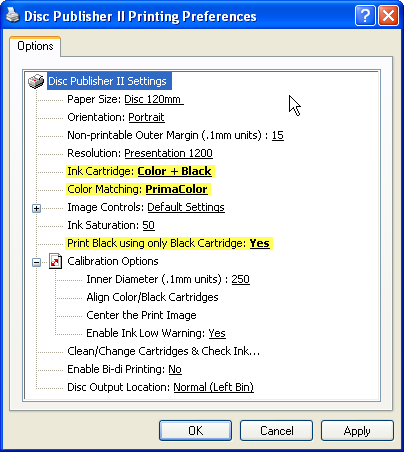 How do I print only to my Disc Publisher from any program on a PC? My Bravo/Bravo II is only printing half or part of a CD or DVD.